We poets often pride ourselves on exploiting the many interpretations that figurative language affords us, and so we may shy away from visuals for fear they will detract from this ability to embody multiple meanings without sacrificing substance that we think separates “real” poetry from most prose. And though we may write poems inspired by visual art, we rarely include images of these works in books. Not so with Patrick Coleman’s Fire Season (102 pages; Tupelo Press). Initially, I expected the images paired with poems in the book to be too on the nose and/or to give away too much. However, the pairings—which include artwork by sculptor Alexander Archipenko and painters Guo Hui, Jules Tavernier, Agnes Pelton, Oskar Fischinger, and Diego Rivera—make sense. Firstly, the book seems to be something of an homage to Coleman’s first daughter’s early years, a time in which she would likely have been less than enamored of a book with no pictures. Secondly, I came to appreciate the insights the visuals gave me into the identity of the speaker behind each of these prose poems. you cried and fed the baby. smaller as you fall: moon, dime, bead, star, pinprick, memory. wearing only a shirt, crouched slightly and pissed on the ground. concrete—her shadow, she said, waving to it. As this excerpt illustrates, much of the charm from these moments comes from seeing the world interpreted through the eyes of a child who seems at once wide-eyed and wise. Coleman wrestles with this in a number of other poems, including “On Ice,” in which he compares his child’s perspective—her ability to “make a tile floor into a skating rink”—to his own, particularly his mind’s insistence on the literal (that a rock is a rock is a rock). Although the book’s cohesion rests mostly on the subject matter—parenthood, the anxieties of a father helping to raise a young daughter in a dangerous terrain, and the terrain itself—Coleman also ties the poems thematically by giving many of them the same titles. We get some metacommentary that gives us a sense of Coleman’s thoughtfulness as a writer when, in the final and title poem, the speaker revisits an “error” he made in the book’s first poem, which shares the same title. There are also the “Developmental Grammar” poems, in which we get to read and parse the young daughter’s child-speak; the “Equivalents” poems, in which Coleman calls into question what is real versus what is fake through language that often enacts mirroring; and others. These poems are spread across the book so that one is initially surprised at encountering pieces with the same titles but then comes to expect it and begins to wonder what they have in common and what functions they serve wherever each of them is placed. This makes for a nice game, kind of like piecing together a puzzle. 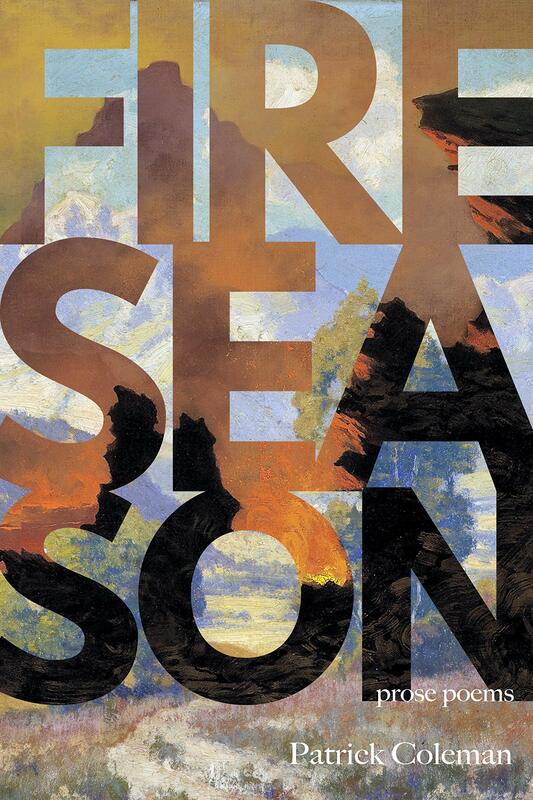 Years from now, I am fairly certain Coleman’s daughter will appreciate Fire Season just as any reader might—both subjectively, as a labor of love, and objectively, as a solid body of work. It addresses timeless themes, and the visual art contained in it spans centuries and civilizations. There is intergenerational wisdom in this book. This entry was posted in Book Reviews and tagged art, book review, Fire Season, patrick coleman, poet, Poetry, prose poem, prose poetry, visual art. Bookmark the permalink.